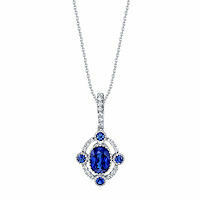 18Kt White Gold Sapphire & Diamond Necklace - 18kt white gold, sapphire & diamond necklace. The sapphires are about 0.43 carats total weight and the diamonds are about 0.18 ct tw, VS1-2 in clarity and G-H in color. The pendant hangs on an 18" inch chain.